You can also have a look at our chart recorders or other temperature dataloggers. Sold in packs of 10 data loggers, the ultra low cost EL-PDF data logger comes with pre-configured alarms for use in Chilled environments  simply press the Start button to begin logging. The LEDs give a quick status update and show whether the temperature has exceeded an alarm condition at any point. When a logging session is finished, simply tear open the waterproof wallet to reveal the USB connector and plug into your PC. The logger will then automatically generate a PDF report that you can save to your PC. The "Plug and Play" functionality and compact, lightweight design of this logger make it ideal for logistics use. It can be used on Windows and Apple (Mac) computer. A cumulative alarm feature is available upon request. This is designed to trigger if the temperature has been within a specified range for a specified amount of time through the duration of the whole log. There will be an LED indication when you are in the cumulative alarm region (both LEDs flash) but an alarm will not be triggered until the specified amount of time has been exceeded (or matched). The data logger can be reused but the battery cannot be replaced. developped to log temperature values during the distribution of temperature sensitive products like fresh vegetable, fruit, sea food, meat and medicine. Even if the internal battery empty is, it still can be used for reading and printing data. Prior to shipment, activate your pre-configured PicoLite loggers or use Fourtec's DataSuite software to manually configure the units at point of origin with the email addresses of the intended report recipients. On the Picolite destination computer, install the weboomerang application (only 1.5 MB). It runs quietly in the background, always connected to Fourtec's cloud server. As soon as it detects a PicoLite logger, the data report is generated immediately and delivered via our server to the email addresses saved to the device's memory. We even save a copy of the report to the local computer. It is an ideal logger for both pharma, as well as food cold chain logistics. Configuration of the short-term temperature logger is as simple as plugging into a USB port, and customizing the included PDF file. With clear indication of configurable alarm settings, including measurement frequency, temperature range, as well as start and end times, ensuring proper cold chain transportation has never been easier. For international shipping, different languages can be independently configured for recipient or shipper. A single-use, economic and efficient temperature data logger. Easy use by press START button till LED green. After finish can be pluged directly into computer USB port and generate detailed PDF report automatically without any special software. It was especially developed for monitoring temperature-sensitive products throughout the entire cold chain. The automatically created PDF and CSV reports contain extensive information that you can use to assess the goods being monitored: data curve, statistical values such as MIN, MAX, AVG, MKT and every single measurement value shown in table form. Pre-programmed disposable PDF data logger for temperature monitoring of the cold chain logistic. 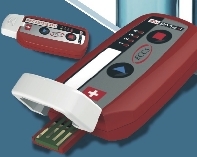 The core strength of this data logger lies in the automatic generation of encrypted PDF temperature report. The advances encryptation could avoid data to be tampered to ensure authencity and reliability. Alarm time delay: standard 30 min. Fresh Tag 1 is an ideal solution for temperature monitoring in cold chain applications. such as transportation for Refrigerated Containers pharmacy, frozen food, fresh fruits, vegetable, fish , cold storage etc, It is with very cost- effective design and simple to operate, smart size minimize the space occupation. The recorded data can be directly ridden via PDF format by PC or cell phone at destination. Small, light, waterproof and in a food safe wrapper, the single used data logger is ideal for monitoring the temperature of shipments in transit. Recordings are started by pressing the start button. The data logger is then placed inside the carton and dispatched. At the receiving end, the data logger is taken from the package and removed from the protective wrapper. It is placed into the USB slot on a computer to get PDF report directly without any software and driver. Start delay: 0 to 60 min. Alarm delay: 0 to 60 min. Real time checks against alarm thresholds and transport duration; MKT calculation is done on the App. The settings can be done with an App on a mobile phone. It can the be placed in the paclkage to record the temperature during its transport. When the goods arive at destination, there is no need to open the package. The user has only to scan the QR code on the package with its mobile phone and the data are automatically downloaded. Other user can see the data with an App Push function. this is not a datalogger but can be used to check the cold chain. It is a press on start electronic temperature indicator, it is designed to offer easy and efficient cold chain management. The three color built-in LEDs help you to see the current alert status directly with a glance, you can easily tell the unexpected over limit temperature during shipment. The indicator can be used in varies applications with user-friendly experience, such as cooler boxes, vaccine, fresh food, laboratories, containers, cooler bags, incubators, etc. The alarm range has to be defined at the order. You didn't find what you are searching for here ? You can look at the page for universal datalogger.